Start the game, then hold M as the game starts to open one of two Music Test screens. Each of the two contains six of the game's songs. The other music test contains Kill the S.O.B., The Nazi Rap, Twelfth Hour, Zero Hour, Ultimate Conquest, and Wolfpack. 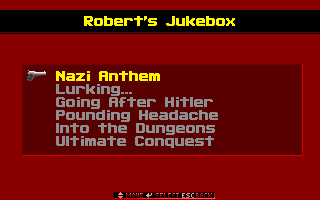 "Robert's Jukebox" refers to Robert Prince, the sound designer who composed Wolfenstein 3D's soundtrack. Please note that many versions of Wolfenstein 3D have been released, and there are differences between the shareware and registered versions bearing the same version number as explained below. Versions 1.0, 1.1, 1.2, and 1.4 are the only known released versions of the shareware game, while the registered versions known are 1.1, 1.2, and 1.4. Version 1.3 was either never created or never released. Please also note that BOTH versions 1.1 and 1.2 of either the shareware or registered version will display "V1.1" in the bottom right-hand corner of the startup screen. As explained below, there are other ways to determine which version is actually present. Some releases of version 1.4 lack the ability to use cheat codes. Version 1.4 was first released with cheat codes, then they were taken out in a second release, then put back in for a third release. The third release is known as version 1.4g but the startup screen will still only display "V1.4" in the bottom right hand corner. In version 1.0, the player's shirt appears tan when firing either the pistol or SS machine gun (weapon '3'). Shareware 1.1 has changed the shirt color for the pistol firing animation to gray, while the SS machine gun still shows the player with a tan shirt. Version 1.2 Shareware changes the shirt color for the SS machine gun animation to gray. Registered 1.1 has gray shirts for both the pistol and SS machine gun. In version 1.0, if you do a regular load to a save when you've cleared some of the floor, your score resets to what it was when you first entered the floor. In version 1.0, you get an extra life for every 20.000 points. In version 1.1 onwards, you get one every 40.000 points. After changing the screen size, the appearing pop-up says "Computing..." in versions 1.0, 1.1 and 1.2. In version 1.4 it's changed to "Thinking...". On HUD, in the bottom left, there's a text which says "LEVEL" in versions 1.0, 1.1 and 1.2. In version 1.4 it's changed to "FLOOR". In versions 1.0, 1.1 and 1.2, you need to push a key to advance from the PC-13 screen. Version 1.4 advances automatically after a small moment. Shareware 1.1 still has no clipping mode. Version 1.1 adds a digit when going over a million points so the last digit goes halfway in "LIVES" part of the HUD, in 1.4 the counter just goes around. Normally, if killed by an enemy the screen will rotate to center on the enemy that fired the fatal shot. If killed by a dog in shareware 1.1, the screen will rotate but not center on the fatal dog. This is corrected in shareware 1.2. A bug exists on Registered 1.1 causing the secret elevator on Episode 1, Map 1 to send the player to Map 2 instead of Map 10 as it normally should. This bug is not present on Shareware 1.1 due to a workaround. Registered 1.2 has this bug fixed. In version 1.4, the music at booting the game up won't start until you've pressed a button to advance from the first screen. Version 1.4 has different background on the start screen. Also "c" has been changed to "© COPYRIGHT". Between Shareware and Registered versions: Elevator sound and death sound of dogs feature different sounds. Version 1.0 has one wall in Floor 7 and one wall in Floor 8 not marked as a secret wall in Episode 1. (You still get 100% secrets though.) Shareware version 1.1 has the one in Floor 7 fixed. Same conditions apply to Shareware version 1.2. Meanwhile, Registered 1.1 has already fixed both. With sharewares, in version 1.4 they are both finally fixed. Apogee versions of the registered game have an extra screen on startup warning that the game is not shareware. Apogee versions of the game will have a "Read This!" option that isn't present in non-Apogee versions. This displays the storyline, controls, and ordering information. A bug exists on Shareware 1.0, 1.1, 1.2 and Registered 1.1, where if the player activates a pushwall and saves the game prior to the pushwall being completed, upon reloading the save the pushwall will be stuck in a "half open" state and not allow the player to pass. This bug is fixed in Shareware 1.4 and Registered 1.4. There are two different ways to activate the debug mode, depending on which version of the game you have. Start the game with the parameter line wolf3d.exe -next. Start up the game and go into a level. 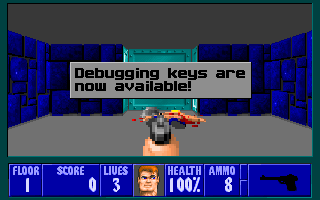 Anytime during play, press Ctrl + Tab + Enter to activate Debug Mode. Start the game with the parameter line wolf3d.exe -goobers. Start up the game and go into a level. Anytime during play, press Left Shift + Alt + Backspace to activate Debug Mode. Now you've activated some nifty little shortcut keys! Tab + B - Select a border color. Tab + E - Automatically complete the current level. Tab + I - Free Items! Tab + N - No Clipping (Version 1.0 and in Shareware 1.1 only). Apparently caused horrible things like game corruption if played around with incorrectly, and hence removed in later versions. Tab + O - Map of level (Prototypes only). Tab + Q - Quit the game entirely. Tab + T - Debug Information. Tab + V - Add extra VBLs, or Vertical Blanking Signals. Has no effect for most players, except maybe altering game speed. Tab + W - Level Warp! Warp anywhere between levels in the episode you're in. Tab + X - Extra Stuff. Doesn't have any noticeable effects. Tab + Y - Change screen size (Prototypes only). Tab + Z - Kill yourself (Prototypes only). The developers included a number of command-line parameters to aid tech support in diagnosing problems over the phone. HIDDENCARD - Disable checking for video card. NOJOYS - Disable checking for joysticks. NOMOUSE - Disable checking for mouse. NOMAIN - Disable checking for main memory. NOEMS - Disable checking for EMS memory. NOXMS - Disable checking for XMS memory. NOAL - Disable checking for Adlib. NOSB - Disable checking for Sound Blaster. NOPRO - Disable checking for Sound Blaster Pro. NOSS - Disable checking for Sound Source. SST - Disable checking for Tandy Sound Source. SS1 - Disable checking for Sound Source on LPT1. SS2 - Disable checking for Sound Source on LPT2. SS3 - Disable checking for Sound Source on LPT3. NO386 - Disable checking for 386. A sign saying "Call Apogee say Aardwolf" is hidden deep within the terrifyingly huge pushwall maze (there's over 175 of the buggers!) in E2M8. Since map editors, trainers, and sprite viewers were made within days of the game's release, the contest was scrapped. In some re-releases and ports, the art file is modified to replace this graphic with a duplicate of the "pile of bones" sprite. A high score contest was also planned, using the codes on the high score table next to the top score, but it was scrapped for the same reason. They were dummied out probably because it would be very confusing to have four locked doors and four keys that looked the same. Notably, Door IDs are hardcoded while normal walls have their IDs corresponding to textures. Yes, this game contains a few unused songs, but they're not really anything good so it's pretty obvious why they're unused. Interestingly, in the "Wolfstone 3D" easter egg in Wolfenstein 2: The New Colossus, these unused tracks were finally utilised to replace the original game's two renditions of "Horst Wessel Lied". "Hitler Waltz" plays on the title screen, while "Victors" replaces the "Nazi Anthem" track played on E2M1. "Kill the S.O.B." (INTROCW3.IMF), the music for Episode 3 Floors 1 and 5, includes a Morse code message playing in the background for most of the tune, manually inserted by composer Robert Prince. This is a message to our hero to (of course) eliminate Hitler, the episode boss, complete with callsigns and a Morse code abbreviation. Note that the music also plays in Episode 6 Floors 1 and 5, where the message makes less sense because Hitler never personally makes an appearance in Episode 6. -.-. --- -- .--. .-.. . - . -- .. ... ... .. --- -. OUT To Big Bad Wolf. From Little Red Riding Hood. Complete mission within 24 hours. The Bin folder on the CD (which contains the installer's frontend) has a file named Wolfimage copy.bmp, which is an poorly compressed, double resolution version of the game's title screen. And when you install the game, the Microsoft Help Project files and bitmaps used to create the game's Windows-based .hlp file are also included! 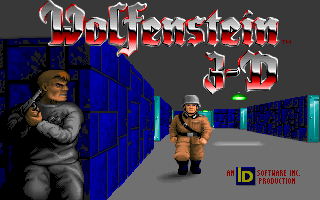 These can be found in the Program Files\Wolfenstein 3D\Readme folder. This page was last modified on 2 April 2019, at 09:59.